Home » Blog » Planes, Trains and Automobiles. . .
For almost 16 years, Thomas the Train has been a fixture in our house. Before Jacob’s first Christmas, Kelly and I had several discussions about what type of toys would last the test of time. Of course the toys also had to be fun. . . for both Jacob and Dad! Christmas day came and a figure 8 track with Thomas the Tank Engine was under the tree. Not sure who had more fun with that toy that Christmas. . . .Jacob or me. Since that time our collection has grown. “We need more curve tracks. And could also use some more straight pieces as well,” was often my advice to Mama when asking for birthday gifts for any of the boys. Why was I giving the gift instructions? Dad became the master builder with the ever growing objective of making each track design more complex and unique. Jacob routinely moved or tossed pieces. As an only child, we knew he was the culprit and a “first born” patience would cause me to rebuild. But then more brothers started to come along. . . .
“Jonah broke the track again! !” Jacob would cry as his younger brother would look on with a face that always said, “who, me?”. “Don’t worry, I can remake it,” which sometimes meant I would merely repair and other times that I’d completely redesign. But the “first born” patience was starting to wear down. For those who don’t know, Jesse (our third born in the third layer deep) has always been the tallest, largest of all the boys. That distinction started from birth and has carried through his first dozen years. So when toddler Jesse started to join the ranks of Thomas the Train toys, a fear of constant track destruction started to creep into my heart. God must have a sense of humor. 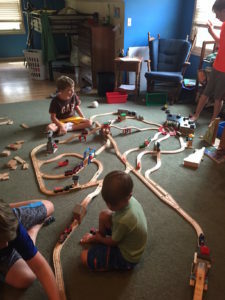 The more complex the track, the more carefully Jesse attempted to navigate with his trains. One hand on the ground, one hand on the train, one foot planted in-between a train curve, and another leg carefully tried to swing over the two layered bridge – this was a common image in the oldest three boys dorm room. 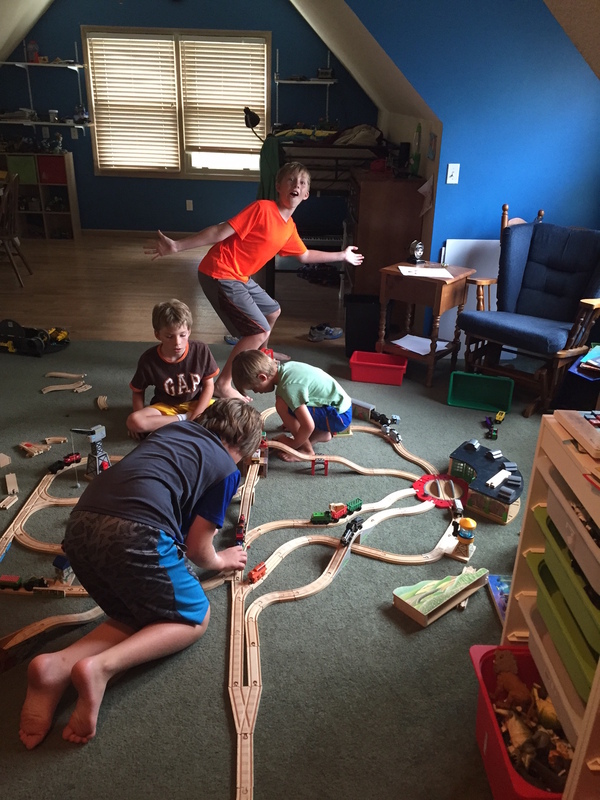 “Jesse broke the track again!” Now it was Jonah pointing blame to his younger brother. “It accident!! I not mean to break it!” Jesse retorted to Jonah who always seemed to have a small glint in his eyes. Truthfully, Jonah’s claim was accurate but Jesse’s heart was not one of ill intention. Instead of the prompt “I can remake it”, the oft answer was usually “I’ll fix it later.” By boy three the “first born” patience was growing ever thinner. Three years after Jesse’s birth, Jeremiah joined our family and then almost two years after that, Joseph became the fifth Buss boy in the third layer. “Jacob, play trains with your brothers” or “Jonah and Jesse will build you a track” were now the common phrases spoken to Jeremiah and Joey. Many years have passed since a new Thomas the Train toy was added to mix. Sixteen years have seen a few cars lost, track knobs broken, and pieces mysteriously disappear. But more telling, my “first born” patience has seemed to change into a “fourth or fifth child complacency”. For several days the track has remained intact and seen many trains move through the course. While it will be cleared soon, I hope I’ve rekindled a forgotten joy coupled with a “first born” patience that can be shared with all of the Buss boys.